I have just joined and have been playing with tungsten putty as an alternative to lead wire for weighting flies. You get this stuff from course fishing shops and it is used to weight carp fishing hook lengths. The putty is quite soft and can be moulded between your fingers to make the desired shape. The only problem is that it remains soft. Has anyone tried it as an ingredient in flies? I have heard that it is used to add additional weight onto casts. Any advice would be welcome. bonds to metal and when cured dries hard. the shape of your fly, which I suspect is a nymph. how heavy is this product? It’s difficult to say how heavy it is.It’s lighter than lead. If you think of plasticine , then it’s heavier than that. It dries to be “rock solid” , so no problems with softness. It’s on the packet, I think it’s about four hours. give the underbody profile,along, the full length of the fly. and then,tying on top of it to form your finished fly. You then dress the fly as you would normally do. But you could/can use it for your idea. Thank you for your long reply. I will get some of that material and ply with it. The reason I am interested in tungsten putty is that it is denser than lead so should enable me to make flies which are heavier without too much bulk. I decided to tie up some Tungsten bodied flies last week. the putty was still soft and had not set. ie the same thing that happened to you. to mix it, as the manufacturer had said on the instructions. Because it was not mixed it remained soft. I wonder if this is the reason your tungsten putty is remaining soft. Thanks for this I will try. What flies did you tye? I was trying to form the bodies for Stoneflies. As explained it did not work. I use the putty to form a flattened body with wing buds which are wider than the body. the body and wing buds. to form a finshed fly in the normal way. Attached are a couple of photos of Stoneflies with tungsten putty from last year. to dark grey and is then ready for use and will go hard. If you don’t do this it stays soft. When you do let us see it. You could, perhaps, use it under a body of some kind of tape material, like Nymph Skin or Flexibody. Otherwise it is just too soft to tie over. Getting flies deep isn’t just a case of weight. Most fly tying materials will float. 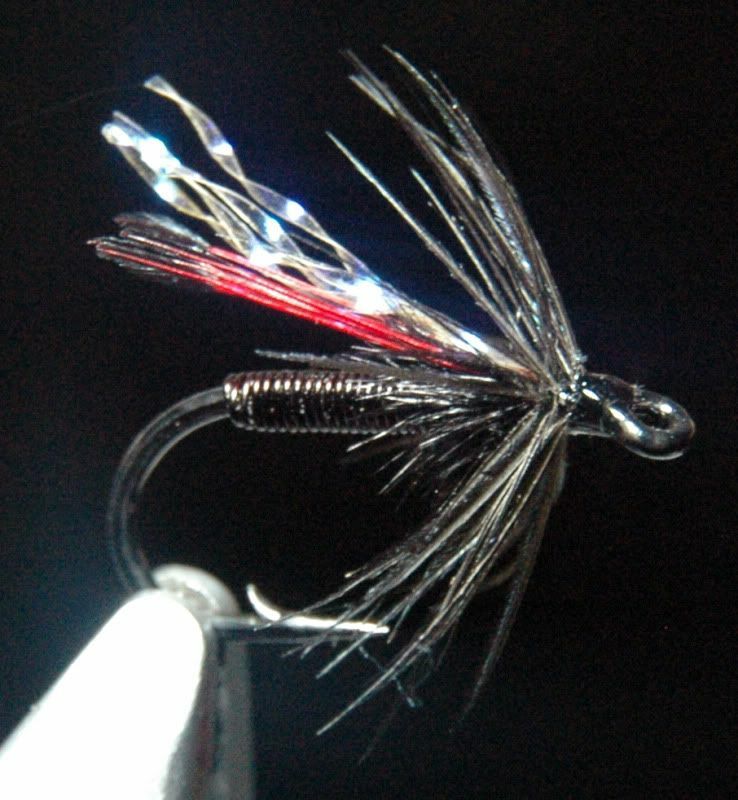 Therefore, if you put lead or even tungsten on a hook then add enough lightweight materials the finished fly will float. A couple of years ago Lawrence Finnie mentioned to me the idea of weaving wire. The flies below are not hugely heavy, but will sink faster than a standard Czech Nymph. The lightweight materials are limited to thread and a tiny touch of dubbing. 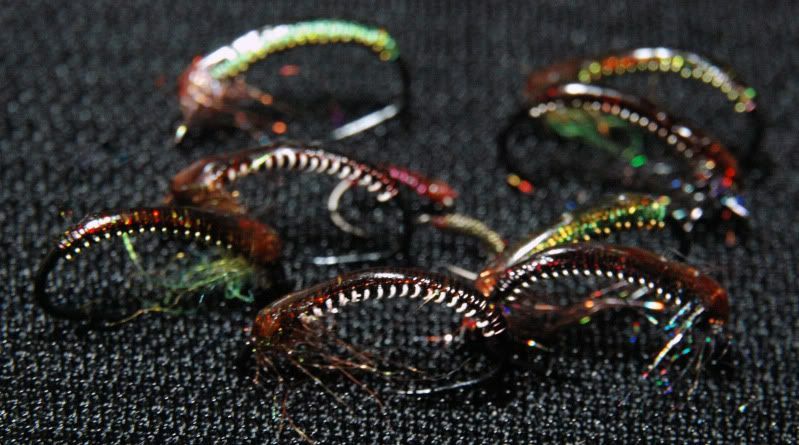 If you don’t want to weave (and with wire it is really easy, as it stays where you put it)you can make the bodies of wet flies out of wound wire. Today you can get a huge range of coloured copper wires. My flies are usually tied with wire in the range of 0.1 to 0.3mm. Most of mine comes from beading suppliers. Nice and soft, best of all very cheap.